Map note: This map does not reflect current knowledge for this taxon. Details here. This annual wetland plant is found across Canada and major parts of the United States, but is absent from most of the southern US (USDA 2011). Although it is reported from Alaska and the Yukon, it is primarily (with one exception) reported in BC from the southwestern mainland region of the province where it is found in bogs and shallow, brackish marshes in the lowland zone. In Flora North America (2011), it is described as occurring in "marshes, fens, ditches, wet woods and swamps, thriving best in open or only partly shaded sites". Phenotypically, this is a very plastic (variable) species (Flora North America 2011). In his rare plants of the Fraser Valley article, Lomer (2011) says of var radicans "This attractive, early-flowering marsh plant is very local along the tidal shores of the Fraser River in bare muddy sites (UBC: Lomer 91-32). Known from approximately 26 sites along the north and south arms of the Fraser in Richmond. Elsewhere in BC few sites are known, and always in estuaries or tidal influenced waters. The rivershores which it inhabits are generally under threat from shoreline dyking and development. Marsh marigold is a popular garden plant and it has been observed as an escape from cultivation. These plants are virtually identical to our native populations, but usually the escaped plants are more floriferous and compact and grow away from tidal marshes, usually in parks and urban sites where they look somewhat out of place compared to the native vegetation." Extracted from Botanical Electronic News #432, January 2011, with permission. A detailed discussion and description of the species is provided in Flora North America. Flora North America does not recognize the varieties of this species. Perennial herb from a short, thick stem-base with fibrous roots; stems erect or ascending, or with age reclining and rooting at nodes, 10-60 cm tall/long; plants smooth. Basal leaves circular to egg-, kidney-, or heart-shaped, 2-13 cm long, 2-19 cm wide, margins entire to finely round-toothed, long-stalked; stem leaves 2 or more, smaller, short-stalked or unstalked. Inflorescence a 1- to 7-flowered cyme terminating the stem or branches, the flowers 1-4.5 cm wide; flower stalks leafy; petals absent; sepals 5 or 6, deep yellow or orange, broadly egg-shaped or elliptic, 10-25 mm long; stamens many. Follicles, 5 to 15 (25), spreading, unstalked, ellipsoid, 8-15 mm long, 3-4.5 mm wide; beaks straight or curved, 0.5-2 mm long; seeds brown, elliptic, 1.5-2.5 mm long, surface wrinkled. Bogs and shallow, brackish marshes in the lowland zone; rare along the coast; N to AK, YT and NT, E to NF and S to WV, TN, NC, NE and OR. Caltha palustris var. 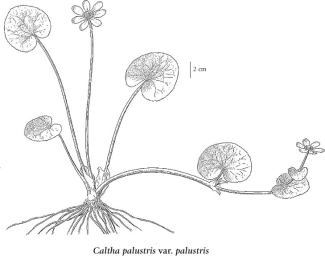 palustris L.